Just after the Raiders were eliminated in their playoff game with the Houston Texans, Oakland quarterback Derek Carr already was thinking about the 2017 season. Now, six weeks after that loss – which Carr had to miss because of a broken fibula suffered Dec. 24 – it’s being reported he is healthy enough to participate fully in the Raiders’ offseason training and practice schedule. 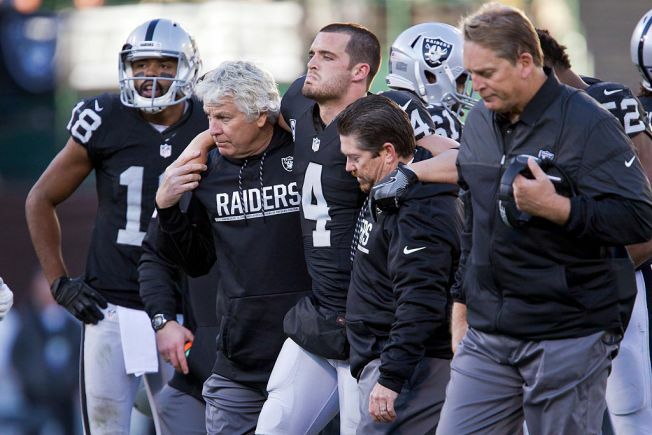 Just as he predicted, Carr will be able to quickly return to the field. On Tuesday, Raiders Pro Bowl tackle Donald Penn said on the NFL Network he’s been in contact with Carr. He says his quarterback is all good. “I texted Derek two days agao and asked how he was doing, checking in, and he said, ‘I’m almost 100 percent,’ ” Penn said. Carr’s older brother, David, an NFL Network analyst who was on the show with Penn, agreed. Carr is coming off the best of his three seasons in the NFL after being a second-round pick out of Fresno State. In 2016, Carr was 12-3 as a starter and threw for 3,937 yards and 28 touchdowns while being intercepted just six times. His quarterback rating has advanced from 76.6 as a rookie to 91.1 in 2015 and 96.7 in 2016.